Everything I write is sounding crabby, so we are going to stick with knitting. Pretty yarn makes me happy. Dark Victory is almost done. I need to seam up the sleeves. I made the sleeves more of a 3/4 length which has nothing to do with my hating knitting sleeves (nothing at all). I also was a little worried about the neckline so I decreased a little faster than called for, which means it has more of a scoop neck than in the original (which I like). 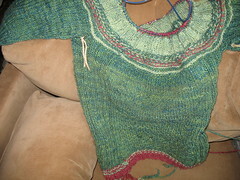 I like the look of the twisted stitches and enjoy how that works on the yoke. I also think the ribbing on the sides - which looks strange when knitting because the ribbing is a little taller than the woven stitch - is so clever and may have to use this pattern as a guide for other sweaters. And I cannot say enough how much I adore every fleck in the Terra yarn. It is soft and sproingy and nubby and each color is completely fascinating to me. ETA: Over at Spincerly Yours I found the link to the errata which explains why my bottom looks different. I tend to just go on figuring I am personalizing the design but, you know, if you're into correctness. Or at least understanding why it looks different.